Do you ever hear noises around your house at night? Something that sounds like an animal, but you’re not completely sure? Well, it could be an animal, and it could be ruining your home. This could spell disaster for a homeowner. We’re here to look at some of the most common animal intruders and signs that they’re in your house so you can make sure your home is safe and rodent free. The most common house intruders, but some of the smallest and trickiest to get rid of or spot. If you’ve spotted the rodent, then you know you have one. But if you’re still trying to figure out if you have an intruder, for starters, keep your nose open. The smell of rats or mice can spread, especially when they typically pee wherever they go. You should also keep your eyes open for droppings. The droppings of rats and mice tend to be smaller, almost mistakable for a chocolate or raisin. Another way you can tell if a rat or mouse is in your home, is noises. Rats and mice are typically nocturnal, so you will hear them running about the walls and scratching at night. Along with that, there may be signs of chewing. Take a look at your running boards, insulation, and other various places you think the mouse or rat may have been. Yes, this includes the open box of cereal you have on your counter. To determine if you’ve got a raccoon roommate, you typically follow the same signs as you would for a rat or mouse. Raccoons, because they’re larger animals, don’t typically stay in the walls. They tend to seek shelter in an attic or basement, so if you suspect something has gotten in to your attic or basement, it might be a raccoon. 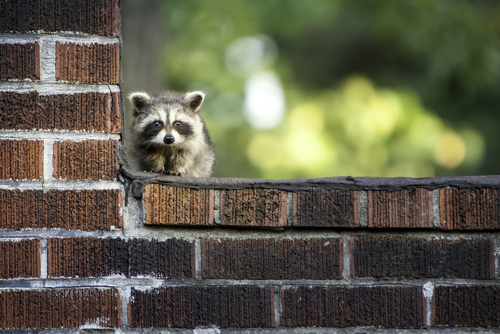 Signs that a raccoon is now living in your house could mean raccoon droppings, ripped insulation, damaged ducts, or chewed wires. Raccoons are also known to get in to garbage, so be sure to get rid of your trash frequently as to not draw them to your house. If you’re unsure if you have a raccoon but have a strong feeling you might, call a professional to conduct a home inspection and help you decide if you’ve got a raccoon. The signs of an opossum being in your house are very similar to the other two. Because opossums are larger than the other two, the signs are slightly different and larger. There will be a more prominent smell, as opossums defecate more frequently than most mammals at a size that is close to a house cat’s droppings. Other signs you might have an opossum are: louder noises, including animal vocalizations, disappearing pet food, and damage to your houses exterior. If you’re unsure if there are animals in your home, call the professionals to conduct a home inspection in Maryland. At Highland Home Inspections, we look at everything inside and outside of the house to make sure you’re safe. Contact us today to learn more. Depending on where your home is, and how old your home is, you may still have lead-based paint on your walls. Lead-based paint is often found in older homes, built before the 1990’s, but it never hurts to check if your home has the hazardous paint. Sure, it’s glossier and prettier and holds the color better, but it can put you and your loved ones in danger. Before your dream-home inspection, here’s the dangers of lead based paint, how to spot it, and what to do about it. Lead-based paint contains high amounts of lead which can lead lead poisoning. This means development problems for younger children which consists of problems hearing, growth delay, short- and long-term learning difficulties, and behavioral problems. For adults, it can result in sleep problems, kidney dysfunction, numbness, abdominal pain and cramps, and more. More serious side effects may include vomiting and seizures. Thankfully, it’s not illegal to manufacture lead-based paint. However, you should always get a local home inspector to go around your house before moving in, just to make sure you won’t be subjected to harsh symptoms of lead poising. There are many signs of lead-based paint. One sign is a fun little thing called “alligatoring,” which essentially means the paint is peeling like scales. Make sure to check all your closets, along baseboards and basement window sashes, or anywhere painters might have missed a spot. There’s also a paint testing kit available at local hardware stores that can find lead on your surfaces. There is a solution in this kit that you rub against the surface, and if the solution turns pink, there is lead. There is various health risks involved for you and others that enter your home if you have lead-based paint, so it’s best to get a local home inspector to test for lead as soon as you can. At Highland Home Inspections, we can test everything in your household for lead, and send the report directly back to you. Don’t put yourself or others at risk any longer, contact us today for more information about our lead-based paint testing services. When you live in a place like Highland, MD for as long as we have, you learn how to deal with harsh winters. Part of doing this is ensuring that your home and pipes are prepared for the cold of the winter by contacting a home inspection company. Anyone who has ever dealt with a burst pipe knows exactly how much trouble it can be. The easiest solution to a burst pipe? Prevent it from bursting in the first place. One usual culprit for wintertime pipe freezing is your hose bib. The hose bib is the outdoor faucet that your garden hose connects to. Even if you shut the bib completely off, there can still be water left in the pipe which can freeze and cause your pipe to burst. Turn the valve off – The first thing you need to do is to make sure your hose bibs are completely turned off. Find the shut off valve within your home and turn it to the off position. Make sure the valve is completely off, or else some water can still get into the pipes. Pack up your hoses – Your next step is to disconnect all hoses, drain any water from them, and store them indoors in a dry location. Drain the hose bib – Even though you’ve already shut off the valve, water could still remain within the hose bib itself. To remove this water, you need to turn the faucet on and allow it to drain. Bleed the shut off valve – After you’ve drained your hose bib it is important to go back to the shut off valve. Once there you need to find what is known as the “bleed valve”, which typically can be found beneath the primary shut off valve. Place a bucket below the valve and allow for any water to drain out. Leave your bib open – Your last and final step is a minor but important one. You want to ensure you leave your hose bib open in case any water finds its way into the pipes. Once done your pipes should be completely water free. If you follow these steps then you will greatly decrease the chance of your home’s pipes bursting. However this is not a be all end all set of solutions, and you may still benefit from the services and advice of an experienced Highland, MD home inspection company. Whether you are preparing to sell or buy a property, contact us at Highland Home Inspections. We can help ensure your pipes remain intact, and can help with any other home inspection needs you may have.